Sue wrote: I believe that is the Tunnel on Malibu Canyon road. It's not very far from where KARR was dug up. Looks like I'll have to go back to the beach, darn. The tunnel is indeed located on Malibu Canyon Rd. Here is a bird's eye view using MS Virtual Earth. Sue wrote: I’m surprised no one has answered this one yet. I’ve still got Rookie status but I’ll give it my best shot since most of these places are in my neck of the woods. Next I would drive around the area. I have recognized near by streets like Lankershim Boulevard and Barham Boulavard as frequently traveled streets. I can recall an episode I think in season one where Michael says, “I wish we could be back in LA.” And right behind them is the Lankershim street sign. Ha Ha. 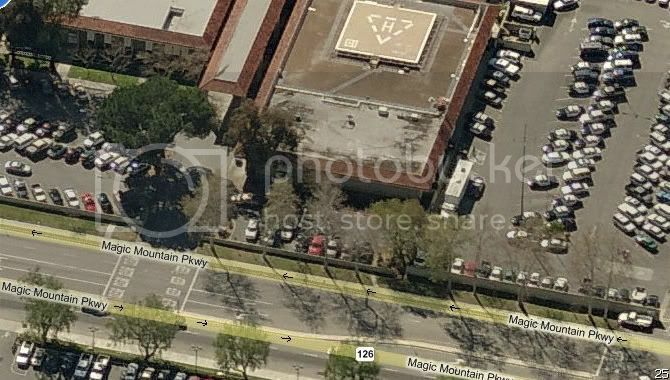 And I know an oft repeated shot of KITT backing out of the Semi was shot on Barham outside of Griffith park. I think some others might have been Mulholland Drive. This was the Knight Estate in the pilot episode. The location of “Slammin Sammys” and I think some other episodes. Now come on you guys, if I a newbie can pull that off the top of my head I think some of you operatives out there must have some more trivia to offer. WHERE IS DEVON'S OFFICE LOCATED IN THE ARDEN VILLA? Hope you can help me solving this curiosity, thanks for your time !!!!! Hey guys this is great! I plan on visiting LA sometime too see some of the sites this threads has in person. I couldn't read through the whole post so excuse me if this has all ready been posted but can anybody get a few Longitude and Latitudes (POI's) on the mansion, hangars, famous tunnel, and the beach where KARR was dug up? It would be really cool if MIO included these POI's on the new KRGPS!!! I might have to give them a call . But I will have a tough time getting exact coordinates living in Missouri . Also did they ever find the KI Jet? I figure it would be in a museum somewhere or someone has it in their backyard. If it is still flying it would be almost infeasible but a slim possibility. Thanks again for this wealth of knowledge and pics! Acid_John_Byrock wrote: sorry Sue but I don't know if you're looking for that building becuse I didn't see some that looks like a restaurant... I hope will be usefull. If you need another picture, you can ask me!. Very Cool!!! Great work all of you. KITT said: I'm afraid there'll be a slight delay. I'm going to have to make a pit stop very shortly. This location is a little bit tricky to find. which still exists after 25 years. Could anyone in LA make a 'pit stop' at the gas station? going through the desert. ..."
BTW, Claremont Bay is actually San Pedro Bay in the real world. Scene: On the way to Las Vegas! "KITT, plot me a route to Las Vegas off major highways." ... Wonderful. I'll call you from Las Vegas. ... I got a plane to catch. ..."
One of the cue to this location is the gate in red circles. I finally solve the mystery of the 'route to Las Vegas'. Michael cut thru the desert to save mileage. they have to get out of heavy traffic in LA first! hey bonnie has a town named after her last name on that map lol. Look above the indicated blue path where it crosses through interstate 40. Very cool one_man It looks pretty out there. Great detective work! Crumbling Down wrote: hey bonnie has a town named after her last name on that map lol. Look above the indicated blue path where it crosses through interstate 40. I was just thinking the same thing, lol. Here is your mom and pop gas station from No Big Thing. Though I must admit with google earth you hardly need me. where one can eat and fill the tank before hitting the road again. Mojave desert where KR was filmed. Sue wrote: Here is your mom and pop gas station from No Big Thing. Fantastic, Sue! It's wonderful to visit the same location in person 25 years later! I liked to know where I place the old headquarters of the Foundation for the Law and the Government (FLAG)? Alex wrote: I liked to know where I place the old headquarters of the Foundation for the Law and the Government (FLAG)? Try to find 1145 Arden Road, Pasadena California on Google Earth and you'll find ... today it's painted yellow. Thank you very much, Dr.Graiman! We covered that on page one of this long long thread .. But here was my attempt to photograph it. I did not know that you were there...but I liked it very much! one_man wrote: Here is a location I'd like to find out. Anyone knows where this tunnel is? SHADO and I went and took some pictures for you. It looks a bit nicer since the 1980s. Where did the naked lady go . Looks good Sue. BTW is FLAG Headquarters now a residence? Did you try and contact the person who owns it? I'd get a pizza logo and take SHADO on a delivery mission and get some better pics . MR2NR wrote: Where did the naked lady go . Looks good Sue. Read the Wiki, it was interesting. MR2NR wrote: BTW is FLAG Headquarters now a residence? Did you try and contact the person who owns it? I'd get a pizza logo and take SHADO on a delivery mission and get some better pics . Yes, it appears to be a residence, and yes I did try. .. I know, I know.. what's up with that? Sue couldn't talk her way into someplace?? I figured there couldn't be too many sewage treatment plants around here, all I had to do was find the one next to a shipping yard and a bridge. Sue wrote: SHADO and I went and took some pictures for you. It looks a bit nicer since the 1980s. the opposite end of the tunnel! Here is a location where everyone needs to drive carefully! Scene: In the beginning of the episode, Devon made a left turn at an intersection. 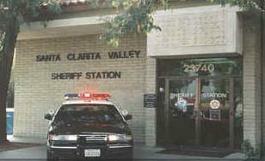 The cue lies on the sign: '14 <- Los Angeles' as seen in the inset below. Devon was pulled over by the cops. cue: SYRACUSE Ave in the red circle. Also, there was a school (bus) in the background. If you see any other tunnels go ahead and post the screen grabs and what episode it's in. I feel like I remember seeing them going through the Kanan Dume tunnels as well. ...Come to think of it I took a picture of one of those a while back. Last edited by Handzus' Stupid Fro on Sun Nov 02, 2008 3:21 pm, edited 1 time in total. Hey everybody. 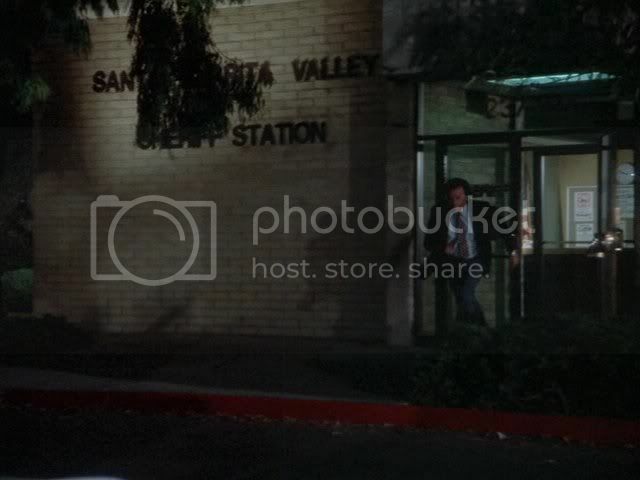 In looking for the House of the Rising Sun building in Knight of the Phoenix I noticed the sheriff's office is actually the Santa Clarita sheriff's office, which is located in the Santa Clarita Courthouse complex.